Join the UE Acivist Net! Home -> UE Activist Net! • Easy to subscribe and unsubscribe! 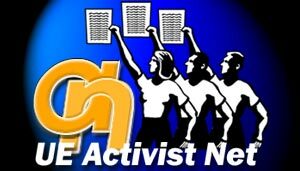 Send me UE Activist-Net email alerts! It's no secret — most bosses couldn't care less about breaking the law when it comes to workers' rights to organize and bargain collectively. From captive-audience meetings to anti-union terror campaigns orchestrated by well-paid union-busters, many bosses scoff at U.S. labor laws designed to protect workers. You can help us change this. Join the UE Activist Net. It's easy. When there's an important struggle where workers urgently need your help, we'll let you know by email. Mostly, we'll be asking you to only take a minute to visit our website to send a message to the boss. Occasionally, we'll alert you to a political issue of great importance to working people. It's really easy. It's effective. A simple moment of your time can help make a major difference as you add your voice to hundreds of others, telling scofflaw bosses that we don't like their misdeeds. Don't worry — we won't overload you with messages. We'll contact you only when it's urgent. Sign-Up Now! It will only take a moment to add your name to our UE Activist Net Mailing list. You can easily make changes or even unsubscribe, once you're signed up. And, we promise, we won't give out your address.